Presenting an Elite Deals exclusive - a bright pink 10 x 10 canopy package deal sure to raise awareness for your favorite cause! 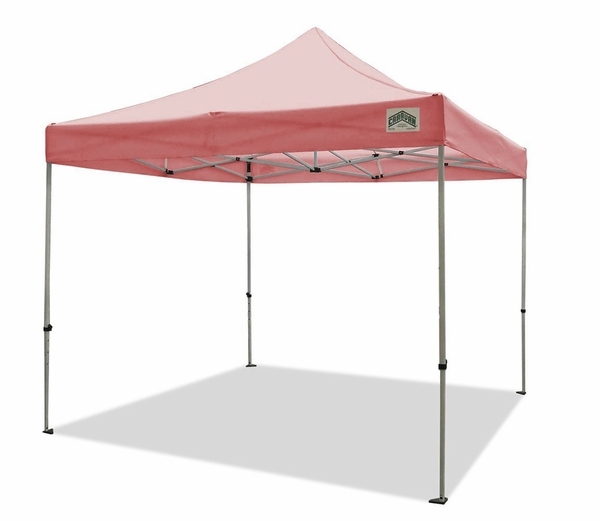 With 500 denier heavy duty polyester fabric, and three matching sidewalls (with an optional fourth, middle-zippered wall), this isn't some novelty-colored cheapo canopy. This is the same fabric used in our toughest commercial-grade canopies, with that carefully chosen and color-matched signature pink. Built with the Caravan Traveler frame, this canopy package packs the perfect match of lightweight construction, strength and easy setup. This setup is so easy, in fact, one person can set this up by themself in under 10 minutes. Its combination aluminum and steel frame will even pack all the way down to just 4 feet, 6 inches in height - perfect for most car trunks! Plus, with the included Caravan roller bag, we've put together a canopy package that will easily pack together into one piece for you to toss in your car and head off to your next charity race or street fair! Pink 10 x 10 top in water-, fire- and UV- resistant 500 denier fabric. Pink sidewalls in 500 denier fabric. Lightweight Caravan Traveler frame with rust-resistant anodized aluminum legs and reinforced steel truss. 10 ft. x 10 ft, fully set up. Peak height of 10 ft, 8 in, with legs fully extended. 5 leg height options, 3.5 inches apart. Folded dimensions: 51 inches x 10 inches x 9.5 inches. Frame + top weight: 45 lbs. Caravan Traveler Roller Bag for easy carry and transport. Made to order- usually ships within 2-3 days.